A small walled red clay city rises from the beautiful vast landscape of southern Morocco: Goulimine, is the capital of the Moroccan camel trade, playing host to the enchanting yearly Camel Festival, and a vibrant stop on your tour of Morocco. This small city 3 hours drive south of Agadir in the lower quarter of Morocco was the main link to Timbuktu in Mali for the nomadic desert dwellers during the 19th Century, crossing the treacherous Sahara desert only with the assistance of their priceless ‘ships of the desert’. Still a meeting point for the remaining nomadic camel traders, Goulimine hosts Morocco’s yearly Camel Festival in June and a weekly camel market every Saturday morning, for a last look into this century old dying trade on your tour of Morocco. 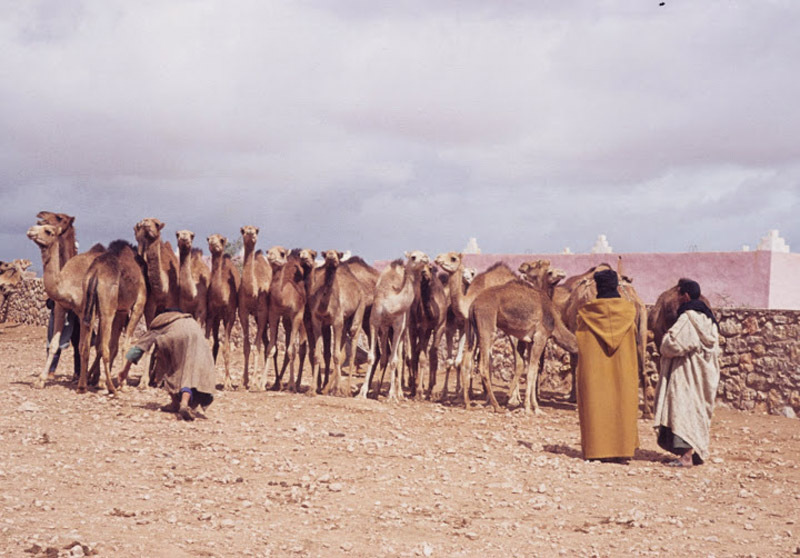 The yearly Moussem (festival in Arabic) of camels draws the nomadic Tuareg people out of the desert in a grand celebration of music, dance, trade and discussions. The nomadic women perform traditional Guedra trance like rituals, with music and dance played on the cooking Guedra pots. Desert tribesmen will meet to discuss, share and preserve their nomadic ways of life living in the harsh unforgiving desert landscape. The rituals are a site to see in your tour of Morocco, leaving locals, visitors and all that see them in a hypnotic mesmerized state of awe. 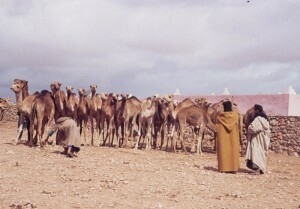 Although a dying way of life, with the more profitable introduction of 4×4’s, the Tuareg people still meet to trade in these so precious of desert creatures. Classified in 2005 by UNESCO as ‘A masterpiece of the oral and intangible cultural heritage of humanity’ the Moroccan Camel Festival offers guest a look into the cultural heritage of the Tuareg people. A 30 minute drive from the picturesque sleepy coastal town of Mirleft, Goulimine is easily accessed from the hand selected Riads in Mirleft of Hipmorocco.com: a must see in the south of the county on your tour of Morocco. This entry was posted on Thursday, June 27th, 2013 at 11:35 am	and is filed under Beyond Marrakech and the Atlas Mountains, Marrakesh Excursions. You can follow any responses to this entry through the RSS 2.0 feed. Responses are currently closed, but you can trackback from your own site.